On a postiive note, Abnett & Lanning have put out some solid comics, so I'm hoping for the best. Doesn't look too bad. I'm not a comic reader by and large but original BSG might just change that. 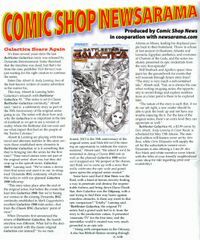 So long as Dynamite holds the rights to do Galactica comics, you can expect nothing but substandard efforts. How long, O Lord? How long????? Classic Battlestar Galactica?? and they mentioned deploying Dr Zee's Experimental Temporal weapon? DR ZEE?????? Already a fail there! As with any series, show, or storytelling medium that goes into some form of series, writers change out all the time....especially in comic books. Many comic books have enjoyed (or endured) both good writers and bad writers in their runs. Likely the same with Galactica. It could very well have some good writing coming up. It isn't a Galactica comic so much as a Galactica 1980 book. I don't understand that company's attraction to something nearly all Galactica fans despise. They should just do a comic version of Superscouts and get it over with. The thing is, if you don't start with the right approach and the right template to what a true "classic" Galactica comic should be which is *starting after Hand Of God* and building off from there, then you have basically failed in terms of vision. An ongoing saga of Galactica should take the approach of picking up with the windows of opportunity left by the end of that episode and from that point build a new dimension of storytelling that above all blends in with the episodes that were made so it seems like a natural extension of that universe. We have seen other projects fail to grasp this. Hatch's novels in particular. The Scalf comic started with the right approach but didn't get a chance to develop itself. Max Press started off on a terrific note but then self-destructed. Dynamite though, has demonstrated time and again that it does not care one whit about the universe of Galactica as it was created and developed over the course of the series. It regards the original as kiddie-fare to be enjoyed by 70s nostalgists and the thing that should know its place compared to the other project. They demonstrated that time and again in the controversies I know you well remember when their aversion to being criticized on this point led them to expel me and several others from their message board. Even though they did eventually come out with a slightly better story that took place after HOG than did their initial, bizarre story set *during* Saga (which could never be squared with traditional Galactica continuity in a million yahrens), it still failed to measure up to the necessary standards of putting characters first and paying attention to how things were set-up. Instead it gave us too much action from start to finish that while entertaining on one level is not how I want to see an official Galactica project develop itself. Dynamite is going to have to do a lot more than just get better writers to change my view of them. They have to finally demonstrate they "get" what Galactica is really all about. This right here!!! All of this!!! Some folks took their criticisms too far with Dynamite, as they did with Skiffy...some even started getting personal, and that's what started the expulsions, which eventually became a bit more indiscriminate. If more people were thoughtful about their criticisms instead of coming across as "my childhood got raped" fanboys, then at least their voices would still be heard, if not heeded. I'm not saying this to belittle those who love Classic Galactica, and actually have their senses about them...I'm just stating the truth. That's why I despise fandom. Radical fans are the ones who ruin fandom, by taking things so passionately and so personally that such folk cannot be taken seriously, which filters down to those who actually have the good sense to learn to snap back to real life....and thus, that particular fandom gets a bad name. This goes for either side of the Galactica fandom fence, and for any fandom in general. I stopped considering myself a fan of anything a long time ago. I don't like the term. I don't like being thought of as a "fanatic". I have my own political reasons for despising the term...and given the way some "fans" act in "defense" of their favorite following, I have little to no reason to make any distinctions. Yes, I go to fan functions like Comic Con, or make "fan films" or "fan fictions" which I prefer to call tributes, but I no longer consider myself a fan of anything. As stated earlier, this is not a slam against those folks who love Classic Galactica, and know how to comport themselves as human beings. In truth, I haven't followed any Galactica stuff that Dynamite has done for quite a good long while. I already have enough old comics and magazines lying around taking up space, and regardless of the quality of the tales being told by Dynamite, I just don't have any more room. It's certainly not out of a lack of interest. There were indeed some "fanatics" at the Dynamite board including one infamous person who no one in their right mind would ever defend. But in my own case, the Dynamite people proved that they possessed very thin skins and given how the guy who was running that site revealed a penchant for not telling the truth on more than one occasion (he was the one who strung a lot of us along by insisting there would never be any story set after HOG unless we got masses of people to sign petitions.....and lo and behold what did we then learn but that story that came next DID take place after HOG!) I think they squandered all their opportunities to come off as reasonable to those of us who simply wanted some *reasonable* objections heard out. These guys had to be shamed into just giving Glen Larson proper credit after they ran their first issue thanking Ron Moore and giving no mention of the guy who actually created the show! Of course there were extremists in that lot, but frankly it was Dynamite's own actions right out of the box and their condescending attitude about the series in general that brought the whole thing on and I think I did act like a human being in that case in letting them know how perfectly ordinary "fans" felt about that situation, which given the context of what else was happening at the time was perfectly understandable. Oh, damn! That is gorgeous! Dont know anything about the content, but the cover is nice. Huh... didn't see this at my bookstore. Need to see what is going on. The first issue is next month. Time travel and alternate realities??? For crying out loud this is what did in Max Press years ago when they went all off-kilter after such a promising beginning. Why is it so impossible for these people to just do a nice simple continuation picking up off "Hand Of God" and take things from there??? Sorry for my perpetual cynicism but I just remain dumbfounded by how not a single official Galactica project ever gets it when it comes to entering things with the right mindset. Because they aren't content to just enjoy, EP. They always feel that they know, somehow, what it "really needs", and so they play with it. They are like meddling children. We've seen this in GINO, as well as the mangling of the Trek franchise, and numerous other shows on TV. Another reason both for, and why, the VS Project is so great. One can tell many and varied stories, without playing Picasso with the material. 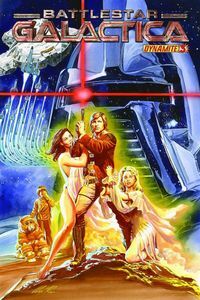 Cover to Dynamite's Battlestar Galactica #3. Cover #3, really tasteless. I'd expect something like that from MAD magazine. DO the artists even know the Facts of the original Series premiere? Adama with a Goatee? Basestars attacking the Fleet? It's like all they know is Galactica 1980 and they were told to include certain facts. Why is it so impossible for these people to just do a nice simple continuation picking up off "Hand Of God" and take things from there??? There have been some Galactica that to me is done right. To me the Cylons were a element to keep the fleet moving from time to time. Actually I liked the aspect that as they got further and further out they saw the Cylons less and less, and I believe that in time the Cylons should not have been a factor at all. What I liked was how the show explored other races. Encountered other beings. And ultimately I loved the banter between the pilots. I liked how in the Marvel Universe comics a lot of stories were taking place amongst the fleet itself. Sooooo many possibilities and what do we always get? Cylons. And lately it seems to always hinge around defending Earth itself. Blah. you can't always get what you want..."
How would YOU do it, now?